It's not easy being a big retailer these days. Amazon (AMZN) is eating almost everyone's lunch. And consumers aren't spending as much as many economists thought they would -- despite lower gas prices and rising wages. It seems that people are saving more and paying down debt. 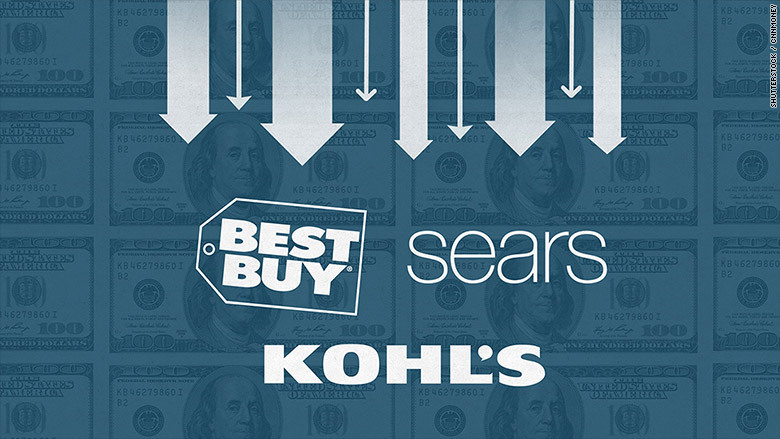 That's bad news for the likes of Best Buy, Kohl's and Sears. All three reported their latest results on Thursday. Best Buy's (BBY) profits did top forecasts. But sales fell during the fourth quarter. And the company is forecasting a bigger than expected drop in sales for the first quarter. Kohl's (KSS) announced that it will close 18 underperforming stores this year. It added that sales for all of 2016 could fall slightly from a year ago. 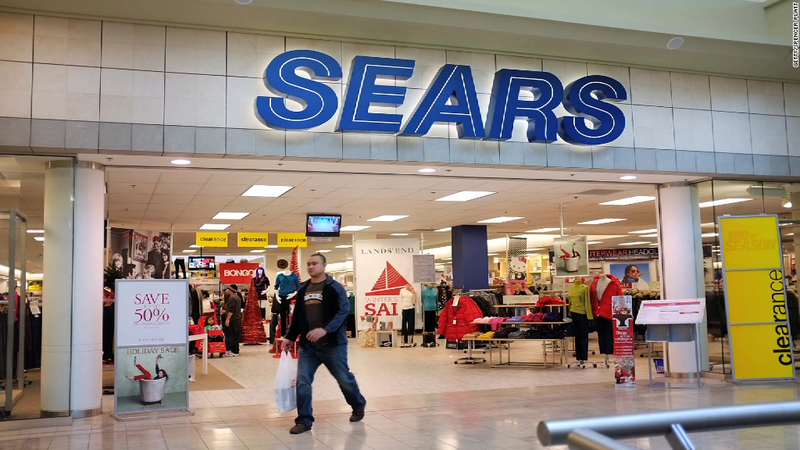 And Sears (SHLD) remains a big hot mess. The company reported earlier this month that it will close at least 50 stores. It's no secret why. Sears reported another quarterly loss. Its cash balance shrank while its inventory levels rose -- mainly due to an increase in unsold apparel. These are not good signs. High-end home furnishings retailer Restoration Hardware (RH) warned on Wednesday that its sales will weaken. Macy's (M) reported terrible sales earlier this week and isn't predicting a major turnaround soon. Yet its stock also rose. Guess why? It is closing stores too. And Gap (GPS) is likely to join the growing list of retailers reporting sluggish sales. It will release its results after the closing bell Thursday. Related: Macy's stock is making a comeback. But its sales are not. The company is expected to post a 5% drop in sales from a year ago. Gap is getting killed by the fast fashion revolution. Customers are flocking to H&M and Zara -- and not Gap, Banana Republic and Old Navy. JCPenney (JCP) is in the midst of a somewhat amazing turnaround. It is expected to report a sales increase when it releases its fourth quarter results on Friday. But JCPenney is also closing stores. It recently announced plans to shut down 7 more this year -- after closing 74 during the past two years. Discount retailer TJX (TJX) , which owns T.J. Maxx and Marshalls, just posted a 6% increase in same-store sales for the fourth quarter. Target (TGT) reported impressive same-store sales growth too. Target appears to benefiting from both the problems plaguing Walmart (WMT) (which is also closing stores) as well as success in building out its own digital commerce platforms to take on Amazon. And the resilient housing market is helping both Home Depot (HD) and Lowe's (LOW). Each big home improvement chain reported solid sales growth this week.